The Pens started their week playing in the second game of a four-game road trip with a four days off after a 3-0 win in Toronto the week before. But first, there was time for a little team bonding. The fresh air and breathtaking scenery of Banff, Alberta, seemed to be the jolt Crosby needed for a week he dominated the highlight reel. Seeking his first goal of the season, Crosby's week started in Edmonton, and with peripheral discussions about the game's top player being had by fans and media, all eyes were on a matchup featuring two of the NHL's undeniably greatest. When all was said and done, both Connor McDavid of the Oilers and Crosby each had two points on the night, but it was No. 87 who had the first and last say on the game. Mid-way through the first period, Crosby opened the game's scoring by redirecting a shot from teammate Kris Letang on the power play. The two sides took a 5-5 tie into overtime, where Crosby absolutely dazzled for his 14th career overtime game-winning goal, successfully dropping jaws everywhere as he skated away with the game's first star. Credit to the night's opponent for a little extra motivation? "You guys all say that [Connor McDavid's] better than [Crosby], and then he has the puck the whole game and finishes off like that," said teammate Patric Hornqvist postgame. "That's why he's the best player in the world." "My experience of being around Sid is that he's just really a driven guy. He doesn't really get caught up in a lot of the storylines from game to game, regardless of who we play," Penguins coach Mike Sullivan told reporters postgame. "I thought he had a great game. He gets two goals, and the overtime goal was one of the prettiest goals that I've seen." Friday night's matchup in Calgary marked the first of a back-to-back at the half-way point of a four-game road trip. Crosby needed less than five minutes to score his third goal of the season with a devastating backhand before picking up a pair of assists as part of an eventual 9-1 onslaught against the Flames. He was named the game's third star as he led his team's forwards in ice time to string together back-to-back multi-point outings as part of a three-game point streak. 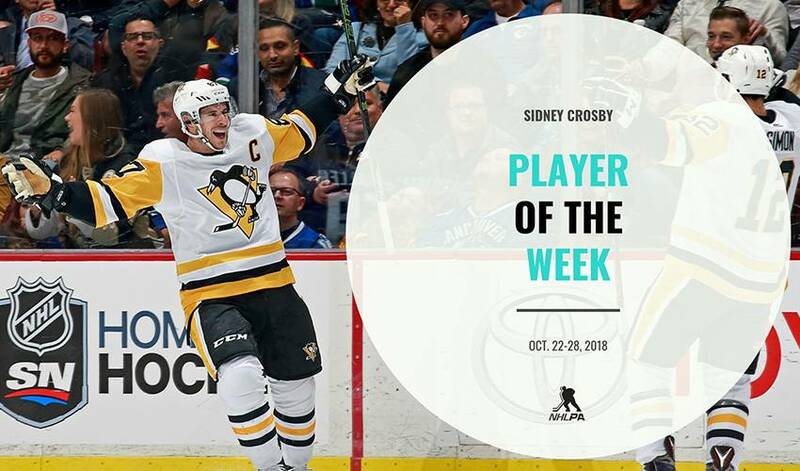 Crosby's backhand was on display again as part of a two-goal effort in a 5-0 win for the Penguins to sweep their swing through Canada. With his fifth goal in three games, Crosby led the game's forwards in ice time and was again named the game's third star. Though the club heads back to Pittsburgh with four straight wins, they return home with heavy hearts in the wake of a tragic shooting Saturday morning at the Tree of Life synagogue in the nearby Squirrel Hill neighbourhood. "Knowing Pittsburgh, I know that we'll stick together and rally around them and be there to support and help them any way we can," Crosby told reporters in the wake of the news. The team has cancelled their annual Halloween theme night for their Tuesday matchup with the New York Islanders and will instead be holding a collection to benefit the victims of the shooting and their families. Until then, the team is hosting a blood drive Monday from 9 a.m. to 3 p.m.
Puck drops Tuesday at PPG Paints Arena at 7p.m. ET.